It wasn’t the offensive explosion that everyone was hoping for, but the Redskins dispatched the hated Cowboys last night at FedEx field before a crowd of over 90,000 fans. The highlights will be covered by new columnist Arjun Murthy tomorrow, but the euphoria of another football season in Washington was palpable this afternoon, as Redskins and Cowboy jerseys and other team logo gear outnumbered pretty much every other article of clothing. Donovan McNabb, slim and fit, worked well behind center, and showed some serious hustle. He picked up 173 passing yards, and ran for another 17. Sadly, he wasn’t able to connect with any of his receivers in the end zone. Chris Cooley and Santana Mass each had 6 receptions. Defensive highlight of the day came from DeAngelo Hall, who returned a fumble for a touchdown right at the end of the first half, to send the Skins to the locker room up 10-0 on the Cowboys at the half. The 3-4 defense worked well tonight, largely keeping Dallas from putting together serious momentum. It’s tough, though, to see what role Albert Haynesworth will have in the 3-4. At times last night, he separated himself from the rest of the defensive huddle on the sidelines, and largely kept out of team affairs. Not exactly the sort of encouraging behavior you’d want to see. Next week? Houston. 4:35pm start here at FedEx. After Sunday afternoon’s 6-5 loss, their fifth in a row, Jim Riggleman called a team meeting. With less than 20 games left in the season, the Nats have clinched their fifth straight at-or-below .500 season. The sweep at the hands of the Marlins, especially when each game was winnable. The Nationals have, with rare exception, not played involved and intense baseball in September. The Nationals finish the season with a week away in Atlanta and Philly, followed by ten games at home against Houston, Atlanta and Philly. I can see this team winning another 8 games, maybe 10 if they push it hard. That’s a pretty significant step up over a 59-103 2009, when you look at it. 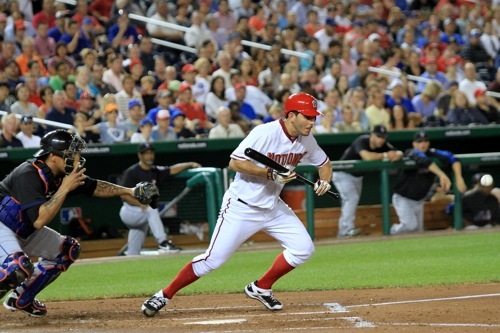 There’s also reasons for hope in Washington, and one of them is named Danny Espinosa. This is a guy that you should come out and see before the end of the season. He’s come up from AAA and made a distinct impression on Nationals fans and management alike. Espinosa’s strong defensive acumen and explosive bat are the sort of thing that should have Adam Kennedy a little worried. In 9 games, Espinosa is hitting .310/.355/.724 and has 10 RBI and 3 HR, making me glad that he’ll be getting half the starts for the rest of the season. As Mark Zuckerman pointed out, 10 of the current Nats are under 27, which should give a lot of hope to Nats fans going forward. Any way you look at it, next season should prove fascinating. The Nats are offering a pretty amazing deal for season tickets for next year: buy two seats, get two seats free, and the team will give you tickets to the rest of this year’s games on the house. $15/seat for the LF or RF corners is a helluva deal for all of next year’s games. D.C. United claimed their fifth win of the season over Toronto off the late goal from Julius James. They’ll be home in two weeks to face Houston. The Mystics lost two straight to the Atlanta Dream to get knocked out of the WNBA playoffs this past week. Virginia Tech was upset by JMU 21-16 in a complete shocker, while Maryland beat Morgan State like a rented mule 62-3. Navy beat Georgia Southern 13-7. Do you leave off the Freedom, or perhaps just forgot? They beat Atlanta yesterday to make the playoffs. Abby Wambach is a star player and made the winning goal. Whatever happened to the “highlights post” by new columnist Arjun Murthy? Did I miss it or did it not happen? Due to an editorial snafu, it ended up not posting. I’ve published the entry, and you can read it here. Sorry for the confusion.